What more could you want in an off road human powered vehicle? This beauty is nearly unstoppable. It is an L Trike or Camel Trike made in China and sold from China thru ZZMERCK (Zhengzhou Merck). I find their media coverage a bit confusing. One place they call it an L Trike and another place they call it a Camel Trike. 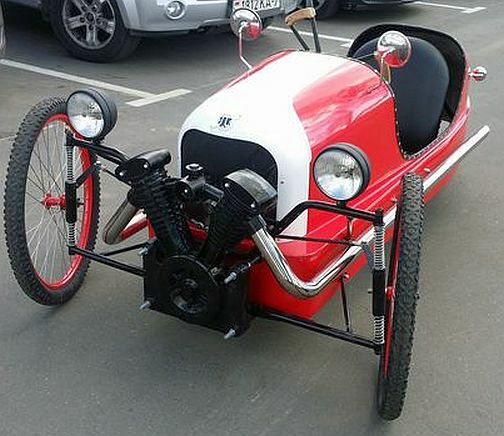 It is not even a trike so I don’t know why they would call it either one. Googling “L Trike” turns up nothing, but Googling “camel trike” gets results. It doesn’t come cheap … $7500-$8500. It looks nice, but I don’t trust the quality of Chinese products. Hopefully this is well made. 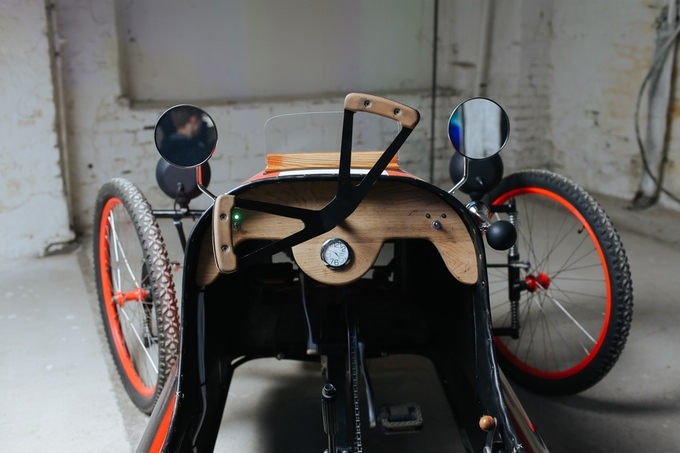 I will say though that this trike is definitely complex in its design which translates into … “there is a whole lot of stuff that could go wrong and cause problems”. I said it is rear suspension and it is, but at first I thought it was full suspension, but after taking a closer look at it I guess it is not.This quad weighs approximately 110 pounds (50kg) so it is not light. The wheels are laced rather uniquely. Although I have seen this before I don’t think it is all that common. They are laced only on the inside of the rim. No spokes attach to the other side. This is covered in one of the videos further below. The one thing I noticed is that the cables are hanging way down low where they could easily snag of lots of stuff riding off road. They created lots of road clearance only to place the cables way down low. That makes no sense! I see it all the time on people’s trikes. Some people just don’t seem to care about such things even if you point it out to them. I wonder if they would change their tune if a drooping cable ruined their day causing a bad wreck. At the very least it could cause serious damage to the cable and possibly other things. Brief description: four-wheel drive system, aluminum alloy 6061 frame, Vee 26×4.8 tire, DNM air spring suspension, SRAM11 speed, 500w mid drive motor, 48v 20ah lithium battery, climbing angle more than 35 degrees. For All Challenging Terrain! The next 4 videos are about the design and bulld of the quad. You may have to pause them to read the English captions in order to follow what is being said. The era was the 1970s … 1975 as I understand is when the first of these were introduced here in the United States. A rather unique recumbent trike of the tadpole configuration came on the scene. Even though it originated in Japan it was the United States where they were most prevalent. They were big and heavy yet supposedly they were built for racing on oval tracks. Obviously they were not designed for touring and general riding. They were quite long compared to tadpole trikes of today. Their days were numbered and now they are more less a collectors item. Not only were they long, but they had a wide wheelbase so they are not too practical as far as fitting on trails and thru various openings. Speaking of being long … the chain on these was 13.5 feet long. That is a lot of chain in case you didn’t know it. 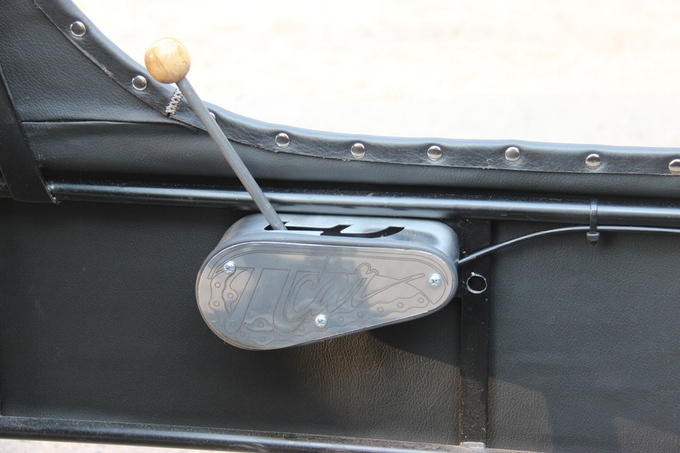 Most modern day tadpole trikes have about 9 to about 10.5 feet depending upon how far out the boom is adjusted. Some say that these Masa trikes did not handle well and could tip over easily … that too much of the rider’s weight was on the back wheel. That being said you can also read that the trike handles well and doesn’t tip over as easily as modern day trikes. Take your pick. I give up. Well, I have already said more than I know about them. 🙂 So I won’t say anything more. I will just post a couple of videos where they are featured and talked about. 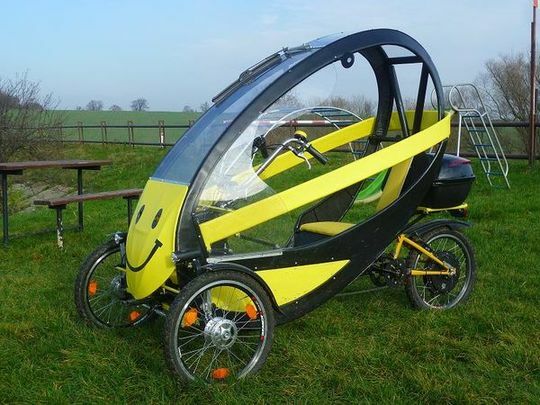 HERE are lots of pictures of two of these trikes. I recently came across a webpage I found interesting and decided to share it here on my blog. It is part of a website of GOPBC.org (Georgia Organization of Parents of Blind Children). The title of it is “All About Bikes – for Parents of Visually Impaired Children“. More Unique Tandem Bikes: Child Sized, Side-by-Side, Back-to-Back, etc. Hauling Solutions– how do you get the bike where you want to ride it? As you can see there is lots covered so it is a good general read about bikes and trikes. THE BEE … WILL IT BE? 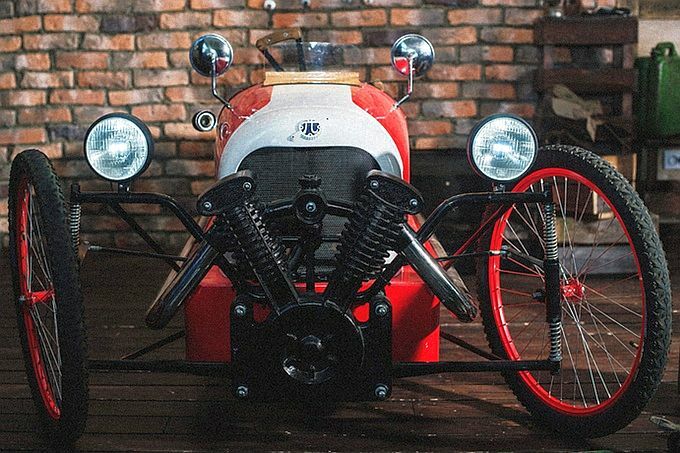 The BEE – a universal urban tricycle. You don’t want to get stung by this one as once it mixes in your blood you just might not be able to shake off its effect. Yep, you would probably just give in and get one. There is only one problem at present … just a minor one, mind you. “The problem is” you ask? It is not yet available. It is currently in a fund raising program trying to get into production. You might say it is a matter of the BEE, or not to be. HERE is an article about this little bug. And yes, it is also to be available in a motorized version. There is only one thing I see about it I don’t care for and that is the bicycle type handlebars. They just aren’t comfortable compared to the typical tadpole trike handlebars. One reason I switched to a tadpole trike is to get away from the uncomfortable ride of a bicycle. Brakes: Sturmey Archer 90mm mechanic drum brakes on the front wheels. Rim brake on the rear wheel. Speed: Shimano 3×5 speed for hybrid . Space: drivers´ height: 1.50 m – 2.00 m, adjustable back support. Lights: Battery lights on front and rear. For those who don’t understand … that’s a joke. It isn’t really that tough! I don’t know if this BEE will ever fly and populate planet earth or not. I guess we will just have to wait and see. It is a cute little bug! It would be a shame to not have it survive. I came across this human powered vehicle recently and was impressed with the concept and the mission of this organization of providing a solution for mobility for those who otherwise have to crawl along the ground as they can’t walk. God’s Word teaches us to open our eyes and our hearts to see needs and then do what we can do to meet those needs. It is what PETInternational.org is doing. 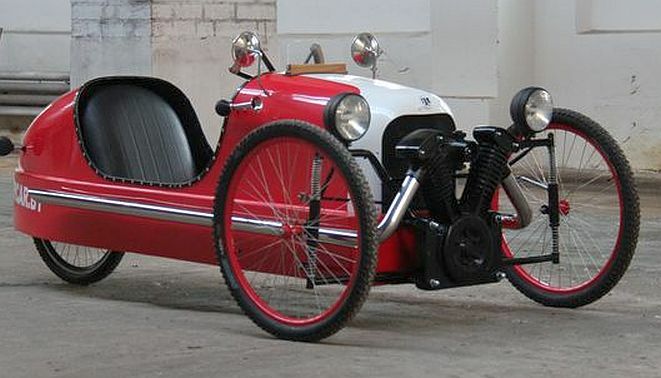 Here is a video telling the story behind the development of this trike. It has solid rubber tires so flats are not a concern. 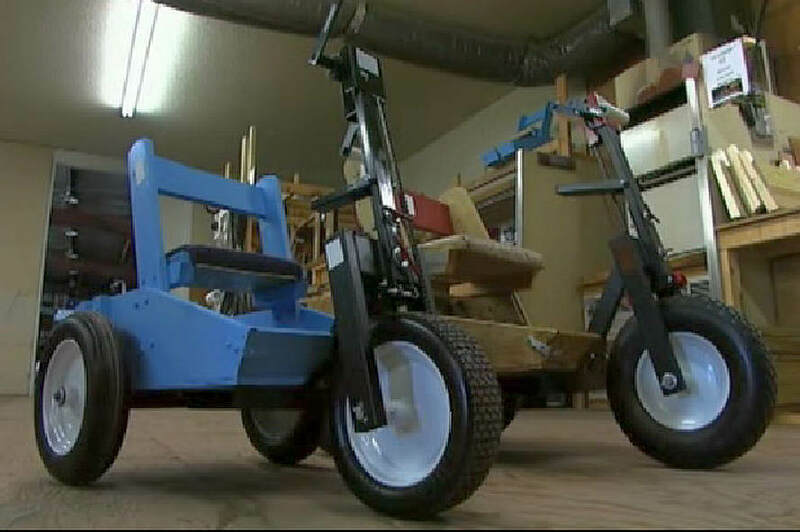 As construction costs go this trike is very low cost … $350 to build and ship. They are a strictly volunteer organization. The need of these trikes is tremendous and funds are sorely needed to build more and ship them to where precious people await them. I like the words seen on the video … “Where there’s a WHEEL there’s a way”.